JEFFREYS BAY, South Africa (Thursday, July 20, 2017) – Filipe Toledo (BRA) has won the Corona Open J-Bay today after besting 2017 CT Rookie Frederico Morais (PRT) in the Final. Stop No. 6 of 11 on the 2017 Championship Tour was graced with flawless conditions, resulting in barrier-breaking performances by the world’s best surfers, eight perfect 10-point rides and no shortage of drama. Toledo, who was responsible for two of these Perfect 10s, showcased a new level to his progressive approach and will be rewarded with a boost from 14th to 7th on the Jeep Leaderboard. Today’s result also marks the Brazilian superstar’s best finish of the season to reboot his 2017 World Title campaign. Toledo’s fourth CT win did not come easy as a stacked field of competitors put the 22-year-old to task in each round. Toledo previously dispatched local favorite Jordy Smith (ZAF) in the Quarterfinals with two impressive 9-point rides and then eliminated Julian Wilson (AUS) in the Semifinals. 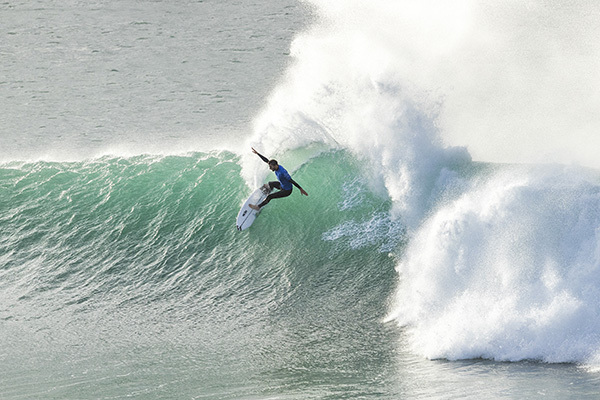 Caption: Filipe Toledo (BRA) claimed his fourth CT victory today at the Corona Open J-Bay. The intense Final saw exciting exchanges between the Toledo and Morais. The two progressive challengers continued to deliver excellent-range scores for the J-Bay crowd, both escaping big barrels and unleashing big carves. With ten minutes left on the clock, another set provided both surfers an opportunity to improve their scores. Morais locked in a near-perfect 9.40 to close the gap to just 0.27 points on Toledo’s 18.00 two-wave total. Toledo attempted to improve his scoreline, but left priority with Morais for the remaining two minutes of the heat. Morais was not able to meet the requirement, giving Toledo the win. Despite losing to Toledo in the Final, Morais delivered phenomenal surfing throughout his first CT event in South Africa. The rookie previously stunned the competition with a Perfect 10 to defeat reigning WSL Champion John John Florence (HAW) in the Quarterfinals, before eliminating 2015 WSL Champion Gabriel Medina (BRA) in the Semifinals. Morais’ career-best finish will now move him up from World No. 18 to 12th on the Jeep Leaderboard. “I just love this place, it is amazing,” Morais said. “Everyone is so nice, the waves are amazing, the weather is really similar to home, and the vibe that you feel here is crazy good. It is an unforgettable place. Thank you to everyone for watching and supporting us. First Final ever on the World Tour and it is amazing. Caption: Frederico Morais (PRT) claimed his best-ever result on the CT by advancing on to the Final of the Corona Open J-Bay. 2015 WSL Champion Gabriel Medina (BRA) was dispatched by runner-up Morais in the Semifinals after the rookie posted two excellent-range scores. Today’s result is Medina’s first Semifinal berth since Quiksilver Pro Gold Coast and his career-best result at this event (previously earned 5th place finishes in 2014, 2015, 2016). Previously at No. 11 on the Jeep Leaderboard, the Brazilian moves to 9th. Julian Wilson (AUS) secured his best result of 2017 with a Semifinal berth today where he was defeated by Toledo. Wilson had a great run during the event including a Perfect 10 in Round 3 and remains at 8th on the Jeep Leaderboard. Current Jeep Ratings Leader Matt Wilkinson (AUS) was defeated by Semifinalist Wilson in the last Quarterfinal match-up. Despite his 5th place result in South Africa, Wilkinson will retain the Jeep Leader Jersey heading into the next CT stop, the Billabong Pro Tahiti. Two-time event winner Jordy Smith (ZAF) was eliminated in the Quarterfinals by Toledo and the 5th place finish (his third of the season) will see the South African remain at No. 3 on the rankings. It was an incredible event for Smith who posted a Perfect 20-point heat in Round 3 and another Perfect 10 in Round 5. The next stop on the 2017 Men’s WSL CT will be the Billabong Pro Tahiti from August 11 – 22, 2017. The women will next compete at the Vans US Open of Surfing, which opens July 31 and runs through August 6, 2017. The events will be broadcast LIVE via WorldSurfLeague.com, the WSL app and on Facebook LIVE via the WSL’s Facebook page. Also check local listings for coverage on CBS Sports Network in the U.S., Fox Sports in Australia, ESPN in Brazil, Sky NZ in New Zealand, SFR Sports in France and Portugal and as part of the EDGEsport Network.